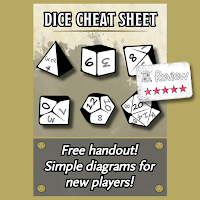 I really wasn't planning on doing any more reviews until I get some RPG projects off of my plate, but there is something that just stuck with me for this Dice Cheat Sheet. This is probably one of the dumbest DriveThruRPG items I have ever seen, but it is also one of the most brilliant. I don't know how many GMs that read this blog have tried teaching new gamers how to play RPGs, but having "been there/done that" far too many times trying to demo games for a certain RPG company, one of the things that really trips new players up is the dice vernacular. Sure, all of us probably know exactly what you mean when asked to roll 2d4 or 3d6, but new players don't. In my experience most players forget about this simple learning curve. When Kenzer & Company added a dice section to their new version of HackMaster Basic, it actually ticked off a fair number of established players. I've only seen one "better" example of explaining dice to newer players and that was a Dungeons & Dragons 3.5 Introductory Boxed set. Actually I'm not convinced it was better than this Dice Cheat Sheet, but it was good. That box set came with a specific set of dice, with every die a different color. On the bottom of each PC sheet was a row of dice. The idea was instead of asking the player to roll a d20 you could just say, "Roll the orange one". 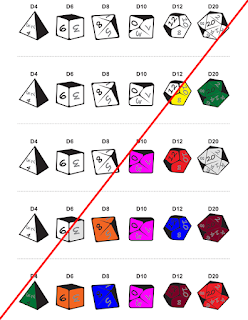 This Dice Cheat Sheet, which is a free download, consists of black & white (actually grey-scale) graphic showing every base die type. 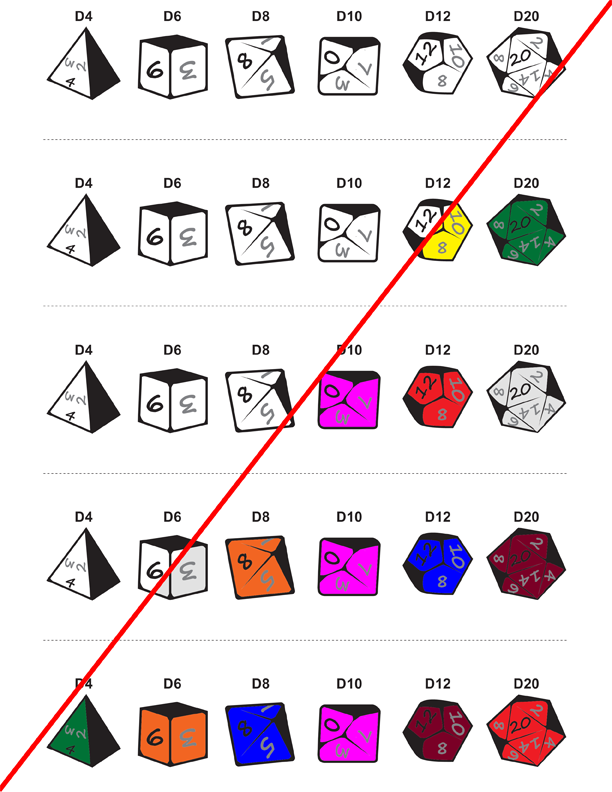 What a GM can do, based on the available dice, is color-code a set for each player so he could say, "roll the red one", BUT.....and I think is better, the GM could change up who has what cheat sheet/colored dice so players more quickly learn the shapes because not all of them have the same set up. I really like the Dice Cheat Sheet because it is a well thought-out design that really required a bit of a paradigm shift. Of course anything that can help get new players into the fold is going to be all-right by me. 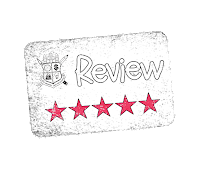 I highly suggest you pick up this freebie and have it as a nice tool in your arsenal.